The husband took lead on this dinner and I’m glad to have him back again! I don’t know why we never thought of it before, what with the Bison vendor and the pork vendor just a booth away from eachother, but we finally did it – Filet Mignon wrapped in bacon! One of the most delicious combinations to ever grace the grill, and the husband managed to cook the filet exactly to my specifications (brown the whole way through, but still tender, yes, I know I’m a freak about how red meat is cooked). The bacon kept the filet extra juicy and it really is a winning combination. 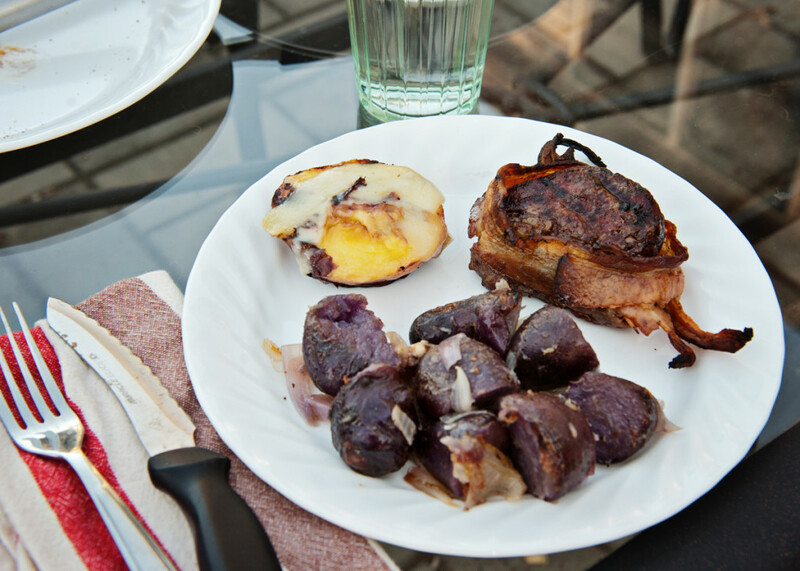 To finish off the plate, we had a grilled peach covered in Equinox cheese, and potatoes grilled with onions and garlic. Good ole meat and potatoes, but a classy meat and potatoes, I think. Such a shame there isn’t more! And, before I forget to mention it, there really is nothing in the world better than nitrate free bacon from our favorite pork vendor at the market – this stuff is SO SO SO beyond anything I’ve ever gotten in the grocery store.